You can also try my mother's version which I have posted here. 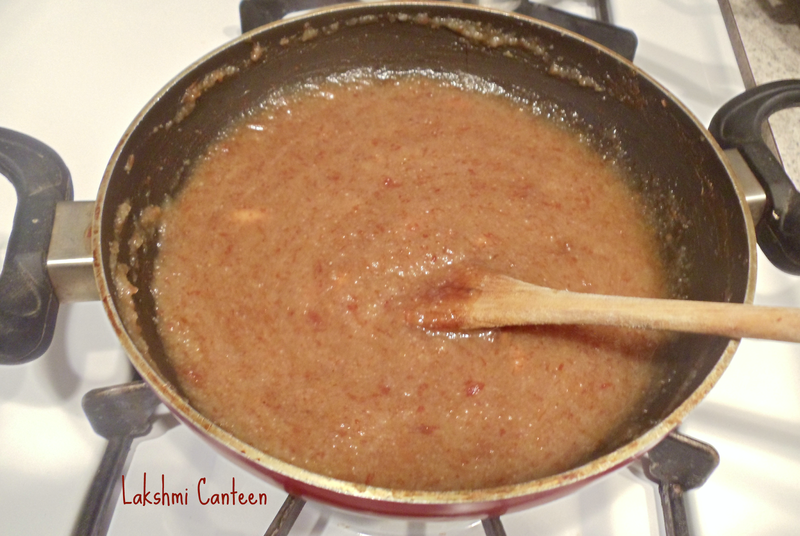 Take grated coconut, jaggery (or sugar), salt in a large mixing bowl. First heat coconut oil in a small pan. Once hot, add mustard seeds. 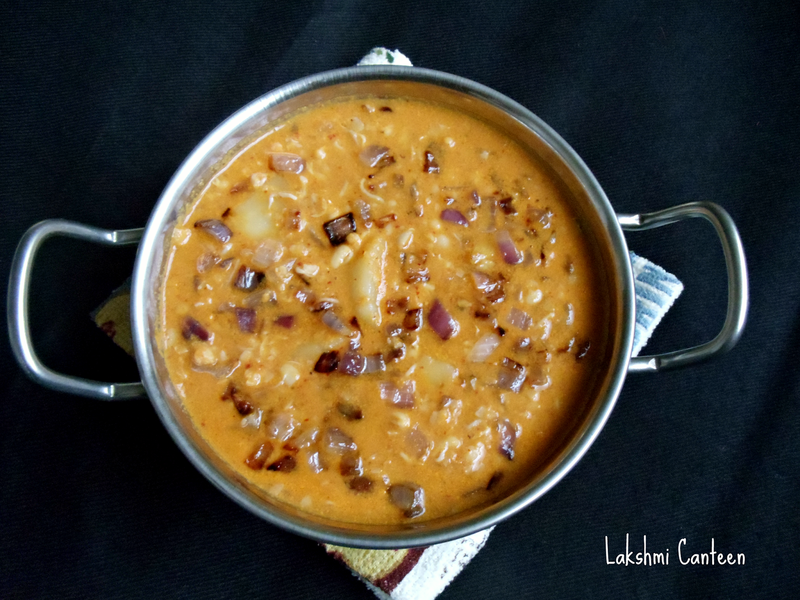 After it splutters, add urad dal. 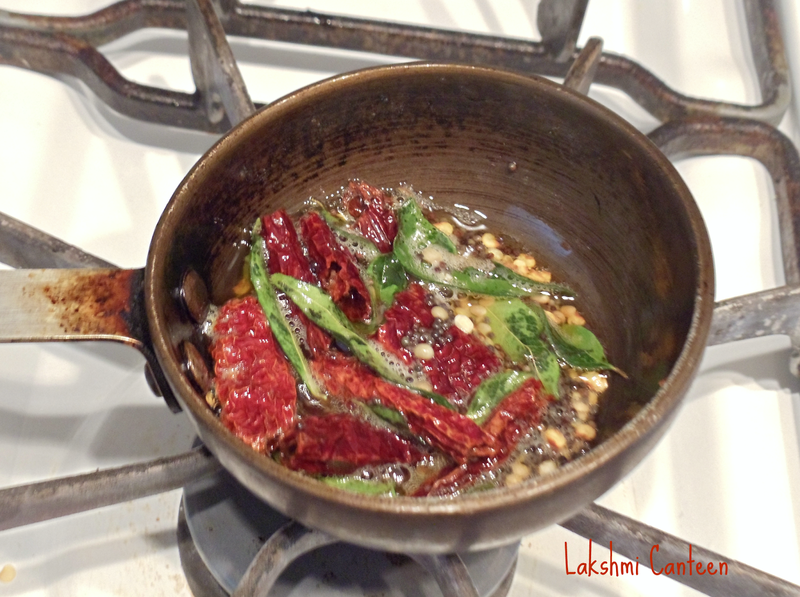 Once it starts turning slight brown, add the broken dry red chili and curry leaves. Fry for few seconds and turn off the heat. Take care not to burn any of the spices. 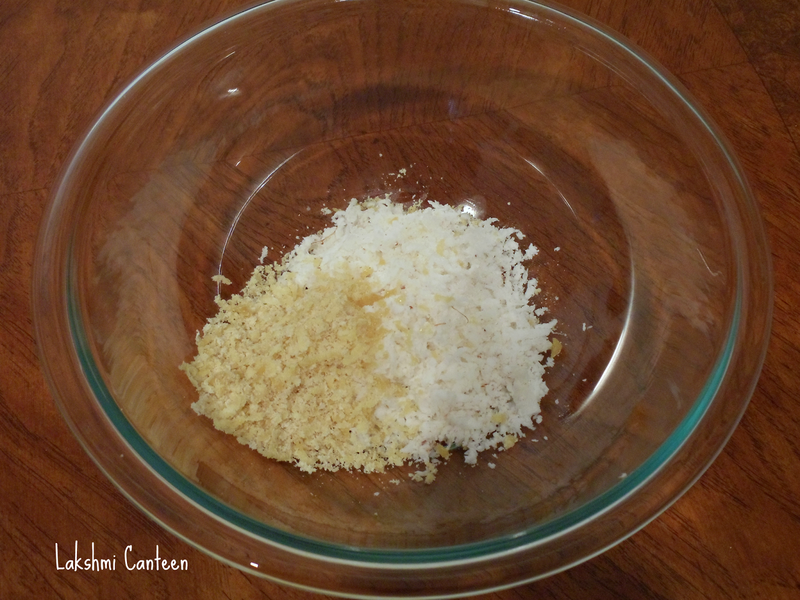 Now add the seasoning to the grated coconut mixture. 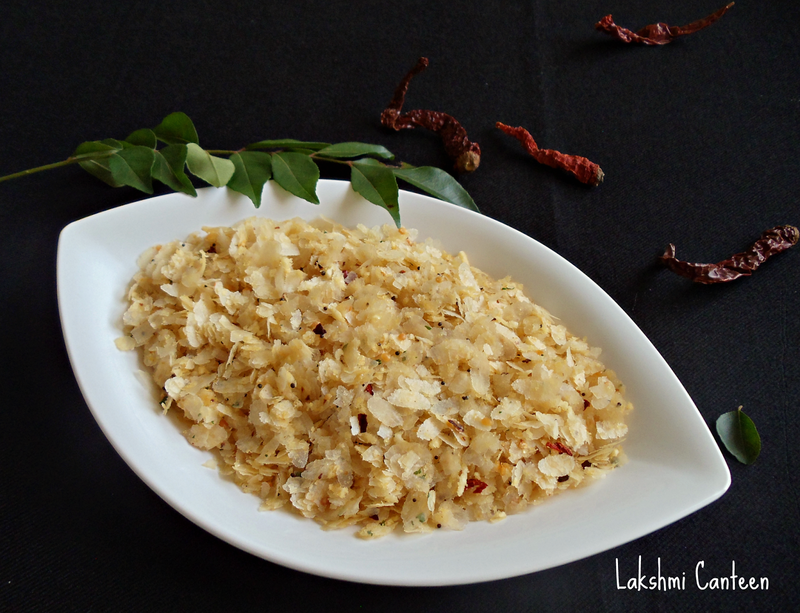 Once it is cool to the touch, start mixing it in such a way that the curry leaves and red chillies are completely crushed. 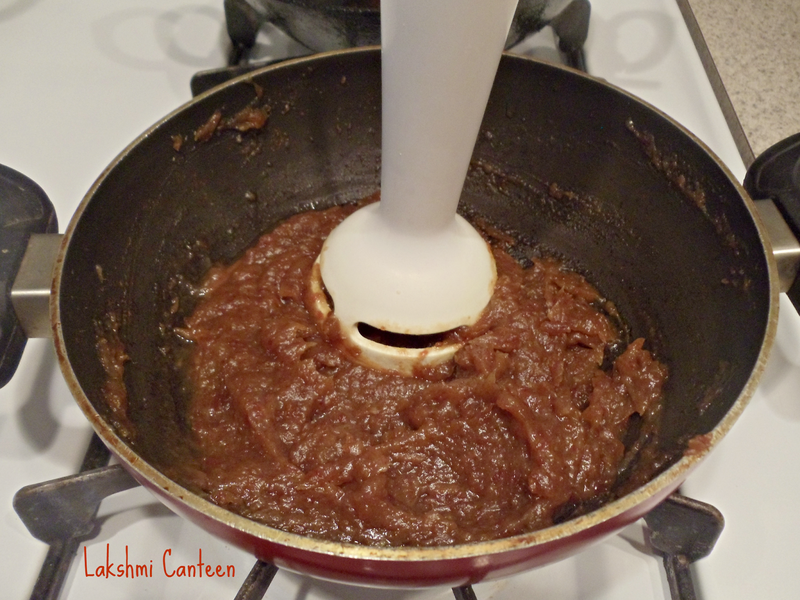 At this step, you can taste the mixture and can add salt or sugar, if required. 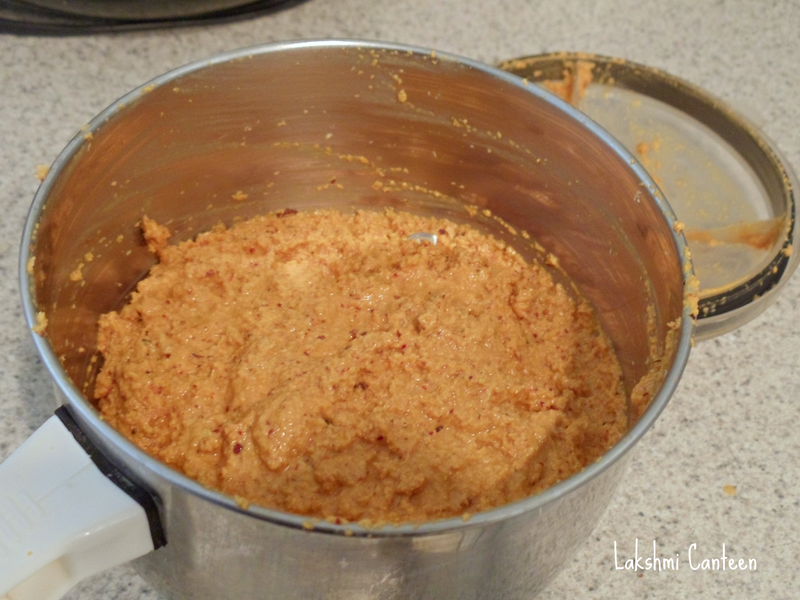 Now add flattened rice to the coconut mixture 1 cup at a time and mix it in gradually until the coconut mixture gets uniformly distributed (I just used half the spicy coconut mixture and saved the rest in a refrigerator). 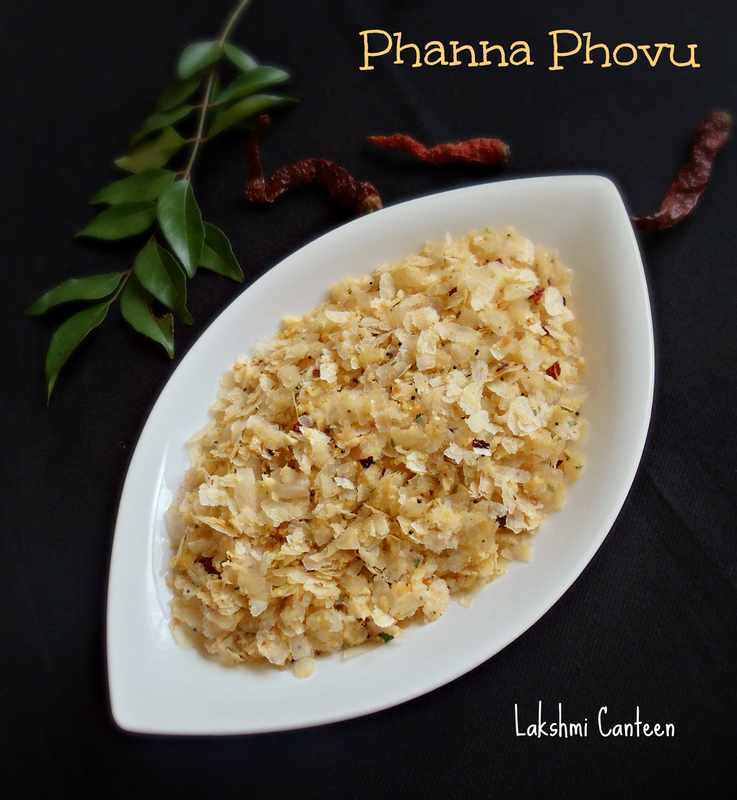 Serve it immediately as it is or pair it with plain upma or chane usli. Above measurement serves 2-3 people. 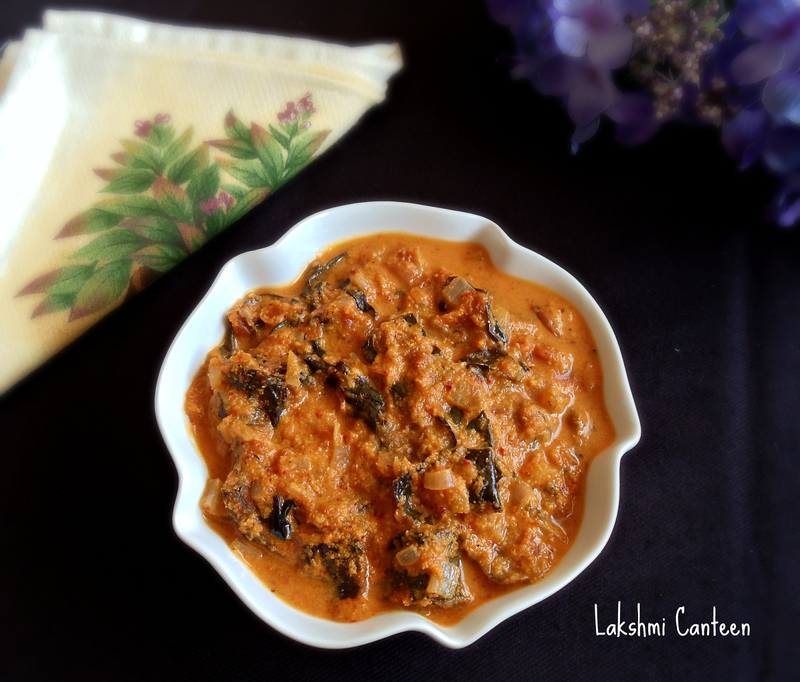 Pathrado is a very popular Coastal Karnataka dish. It can be prepared in many ways and I have posted three versions of it. 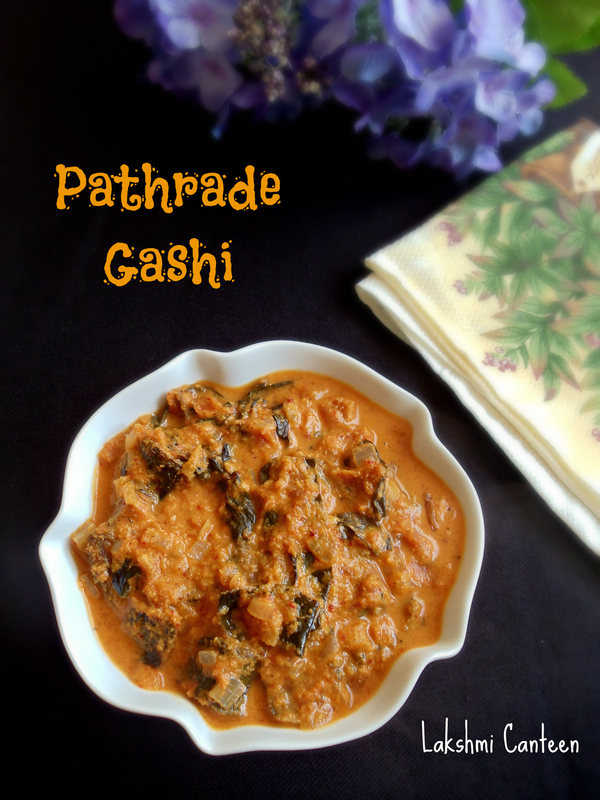 Pathrado is either eaten as it is with a good drizzle of coconut oil or it is simmered in a mild coconut gravy (called Gashi) for few minutes and then served. 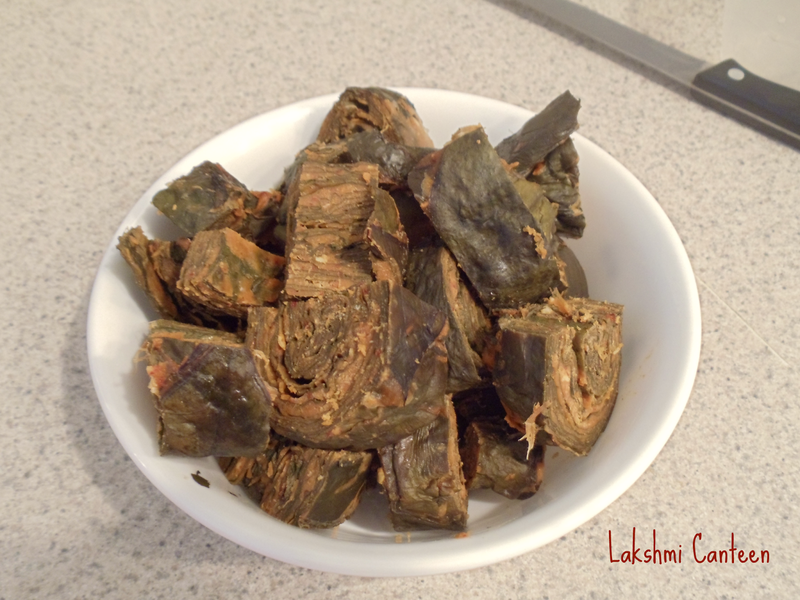 My husband loves it this way and hence I make it whenever we get a chance to find the pathra leaves in the Indian stores. Give a rough chop to the pathrado and set it aside. 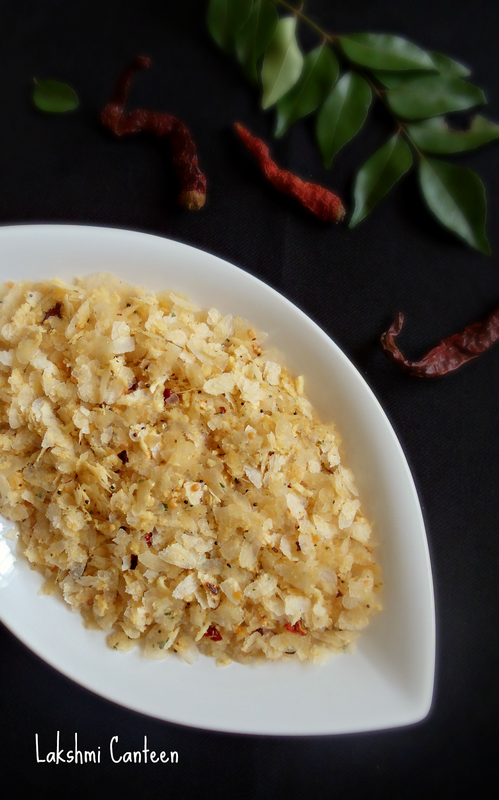 To make Masala - Grind grated coconut, roasted red chillies and tamarind to get a fine paste. Add little water, which helps everything to come together. 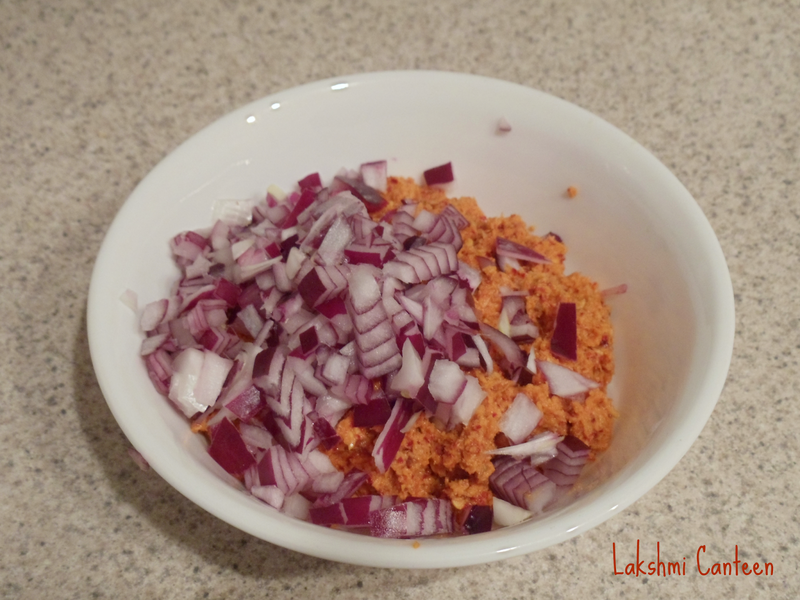 Now transfer the ground masala along with half of the chopped onion to a large pot. Then add sufficient water and salt. Start heating this mixture. Once it comes to a boil, continue heating for 2-3 more minutes. Meanwhile prepare the seasoning. 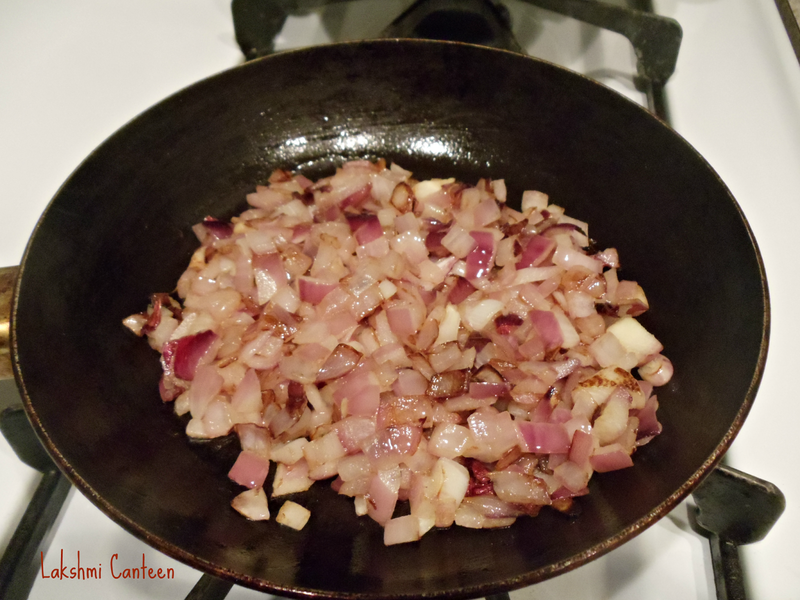 For seasoning - Heat oil and add the other half of the chopped onion. Fry it until it turns golden brown. 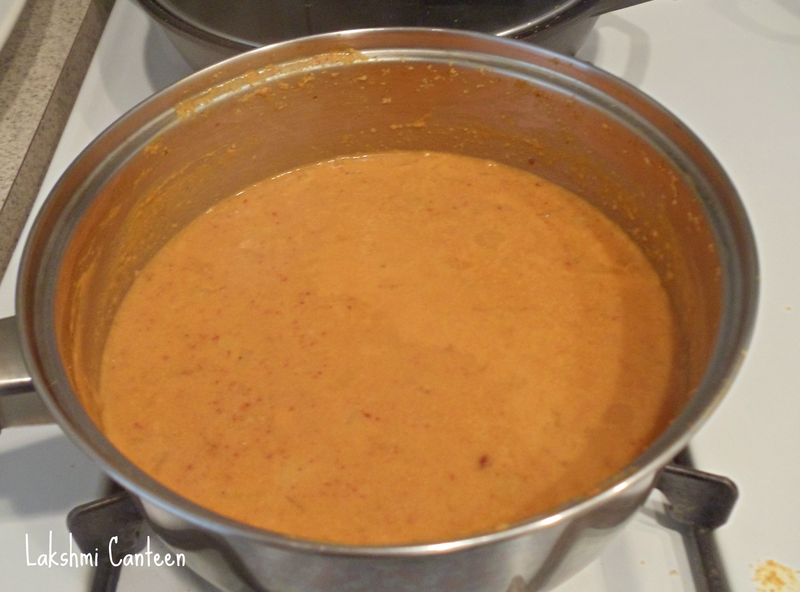 Add this to the gravy and mix well (at this point the consistency of the gravy should be little watery. 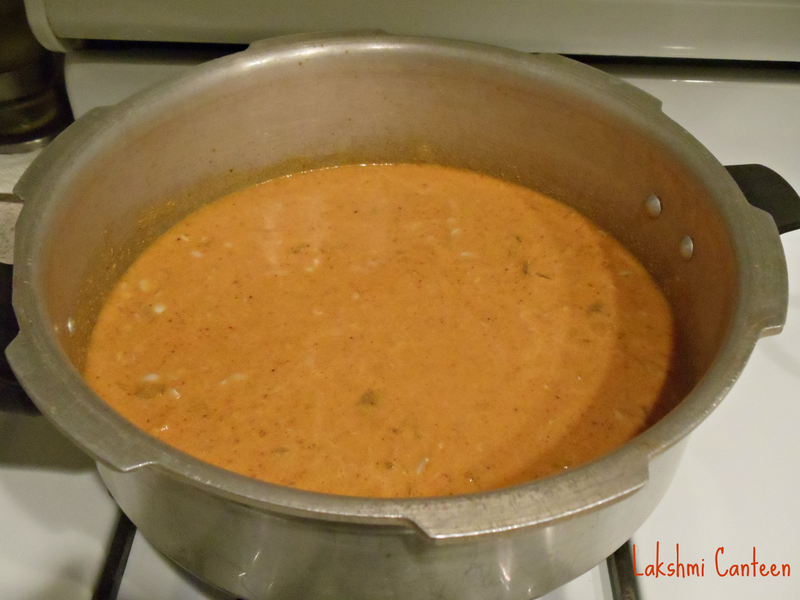 This is because once we cook pathrado pieces in this gravy, it absorbs most of the moisture). Now finally add in the pathrado pieces. 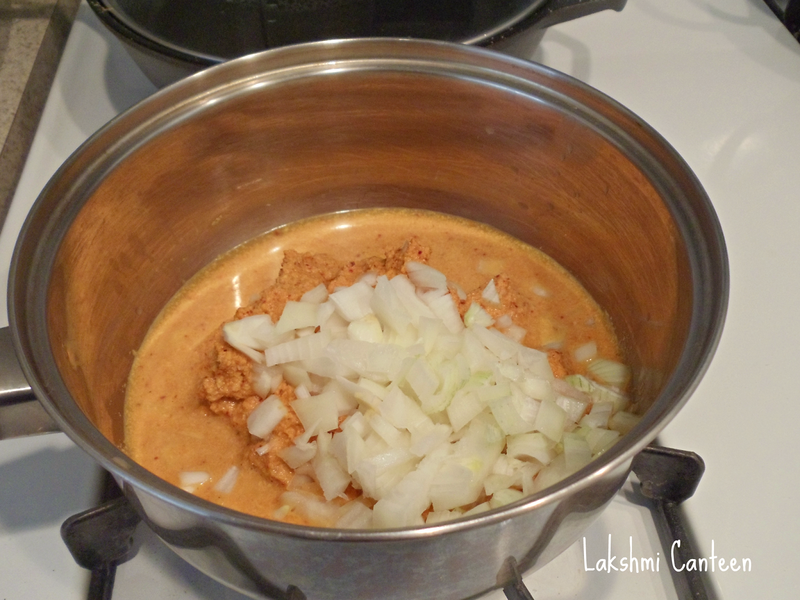 Mix it well and let it cook in the gravy for 3-4 minutes. Then turn off the heat. 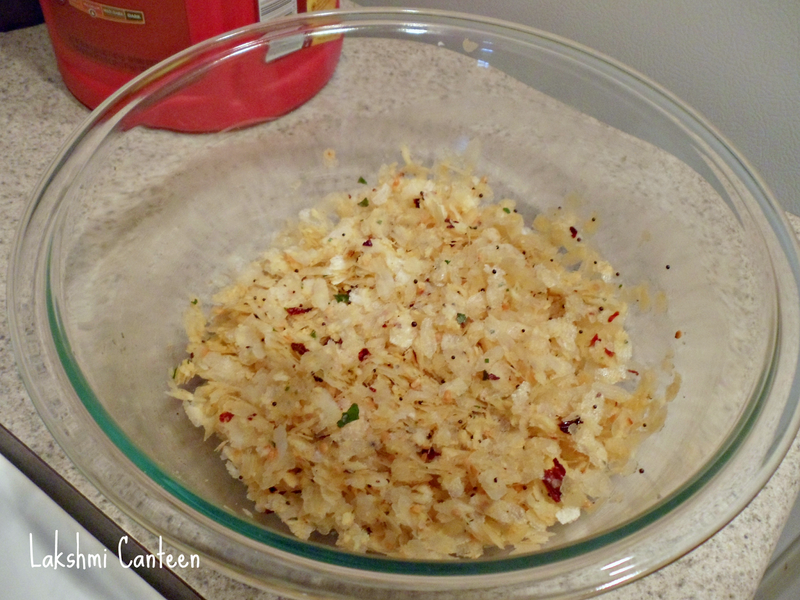 Serve it hot as a side dish to rice. Above measurement serves four people. 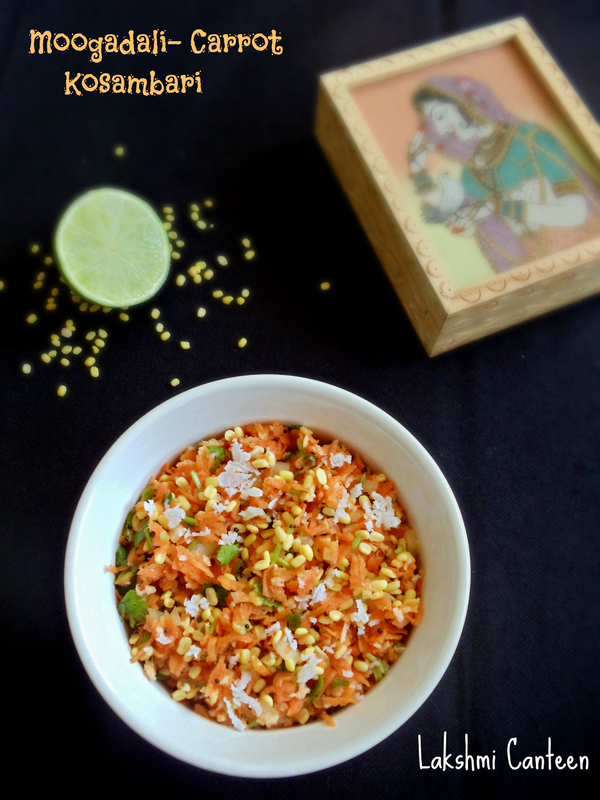 Kharjura Paaysa is an easy dessert. 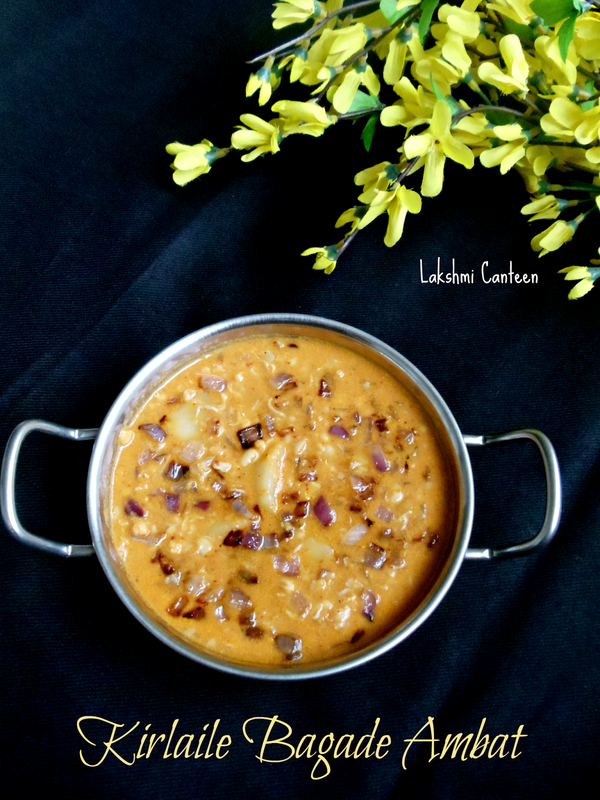 I got this recipe from a cook book written by Kaveri B S. This dessert is simple yet tasty. 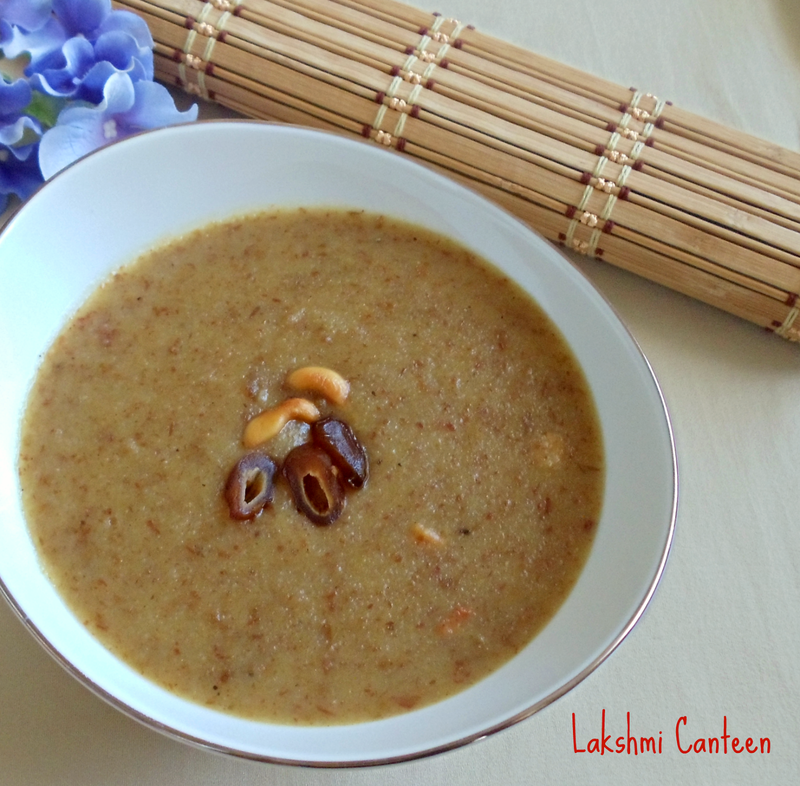 The sweetness from the dates, texture from the semolina and the richness from the coconut makes it tasty. *You can substitute plain whole milk. 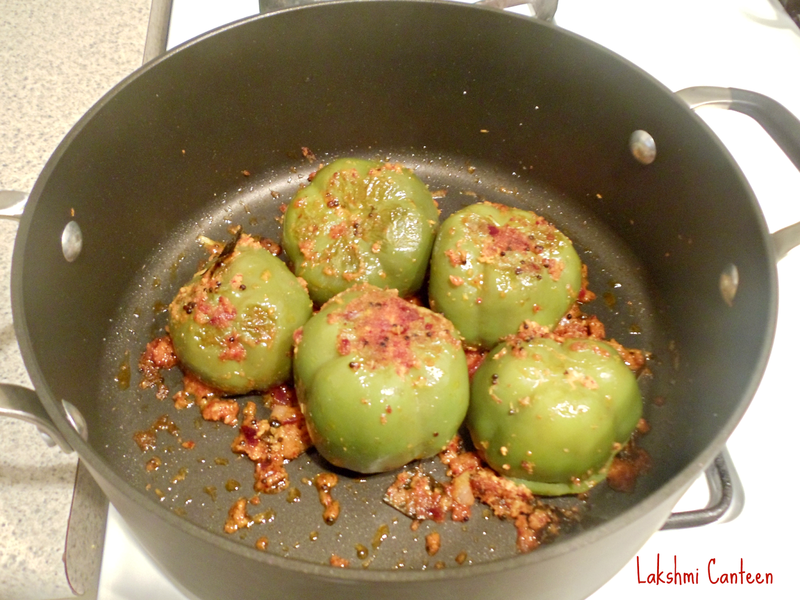 Then cook them in a pan containing little water, until soft. 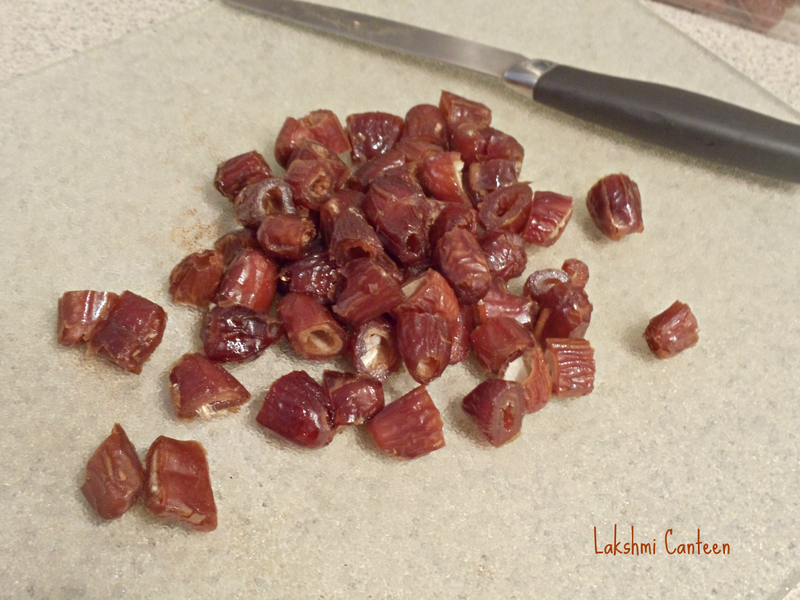 Then grind them coarsely (I used a hand blender). Then in another pan start heating the ghee. 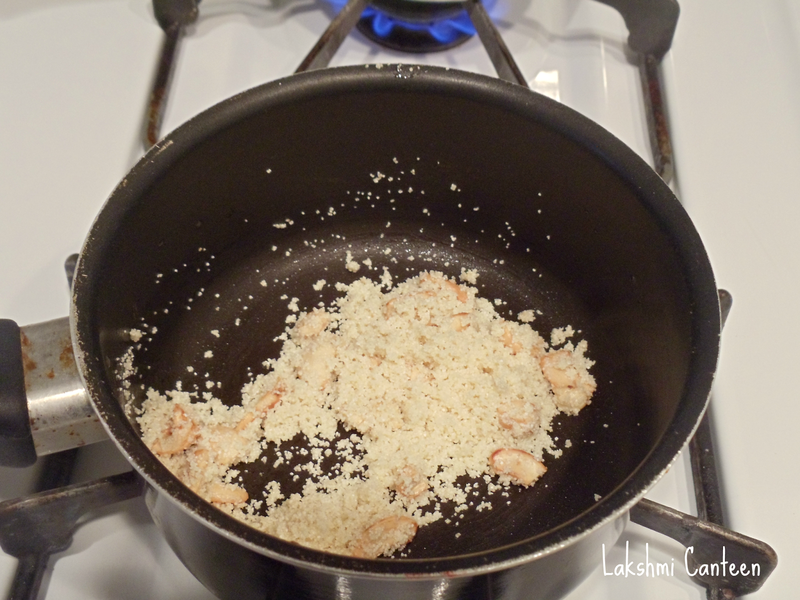 Then add broken cashew and fry until it turns slight brown. Now add the semolina and roast it until a nice aroma is got (when the semolina is roasting make sure you have a cup go hot boiling water ready). Once a nice aroma is got, add the hot water carefully. Let the semolina get cooked. Then add the ground dates and mix well. Taste the mixture and add sugar accordingly (add water if the mixture is thick). 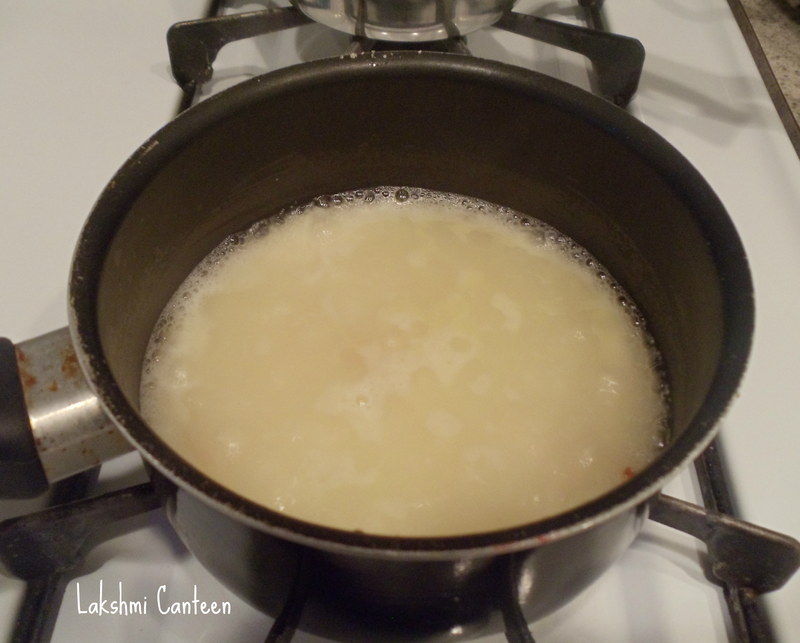 Then finally add the coconut milk and bring it to a gentle boil. 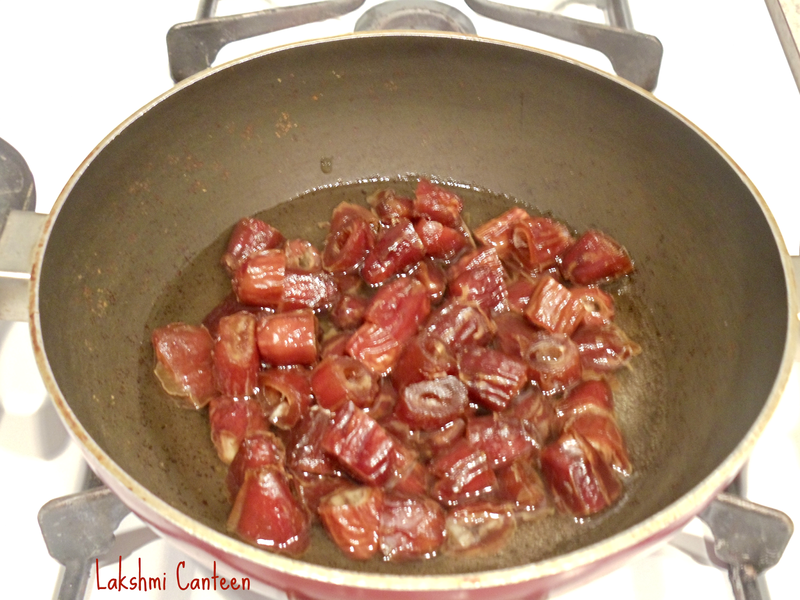 Turn off the heat and finally add cardamom powder and mix well. Serve it warm. Above measurement serves 2-3 people. 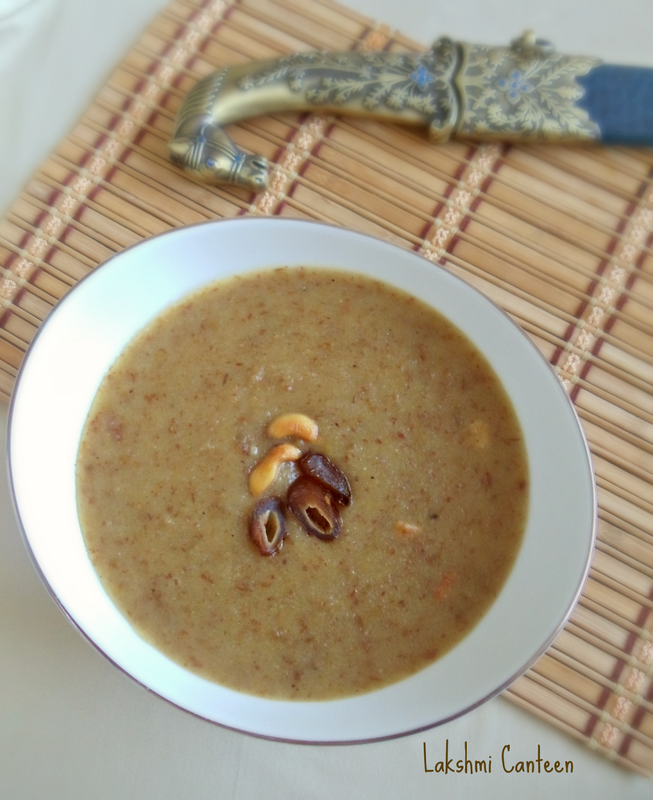 Note: The semolina gives thickness and texture to the paaysa (pudding). You can totally skip it, if desired. 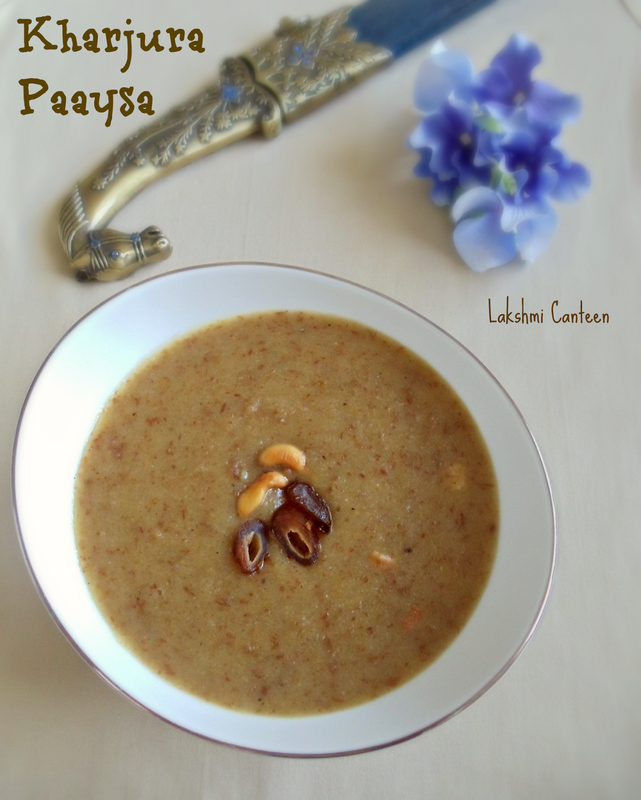 Since we add semolina, the paaysa tends to thicken as it cools. So you can add hot milk to get the desired consistency. 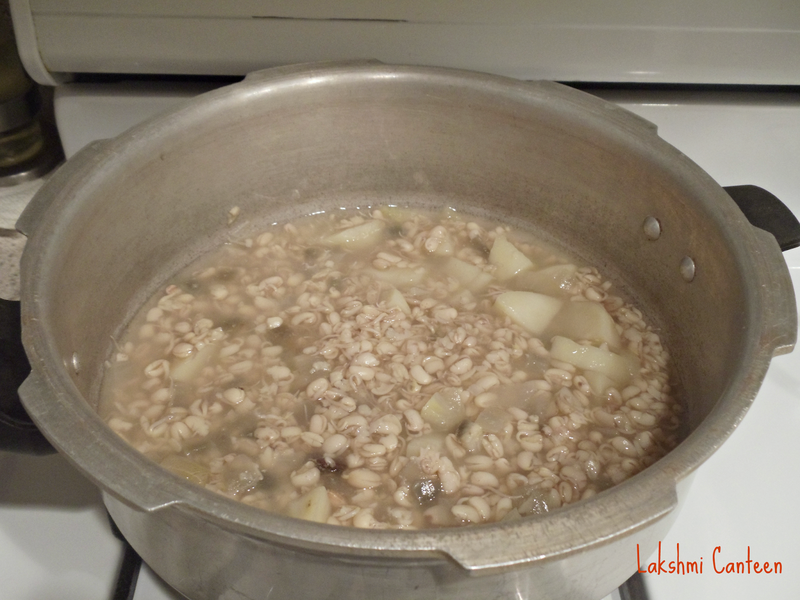 Wash and soak moongdal for one hour. Meanwhile grate the cleaned carrot. 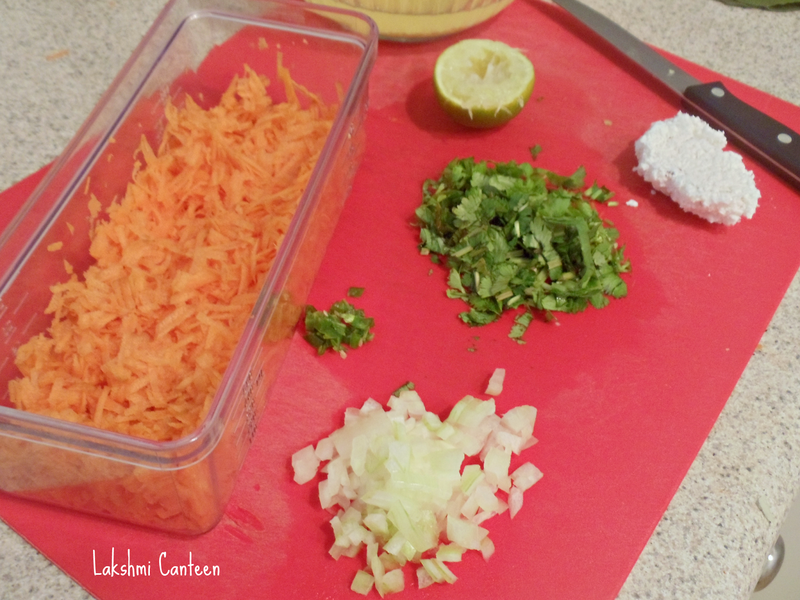 Chop cilantro, green chillies and onion. Now drain the water in which moongdal was soaking. 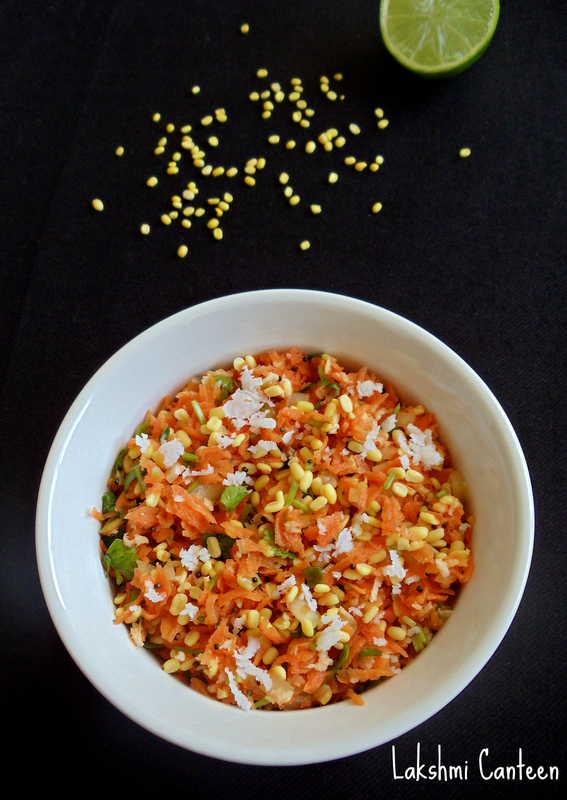 In a mixing bowl, add the soaked (and drained) moongdal, grated carrot, chopped onion, grated coconut, chopped green chillies, chopped cilantro, lime juice and salt. Mix well. 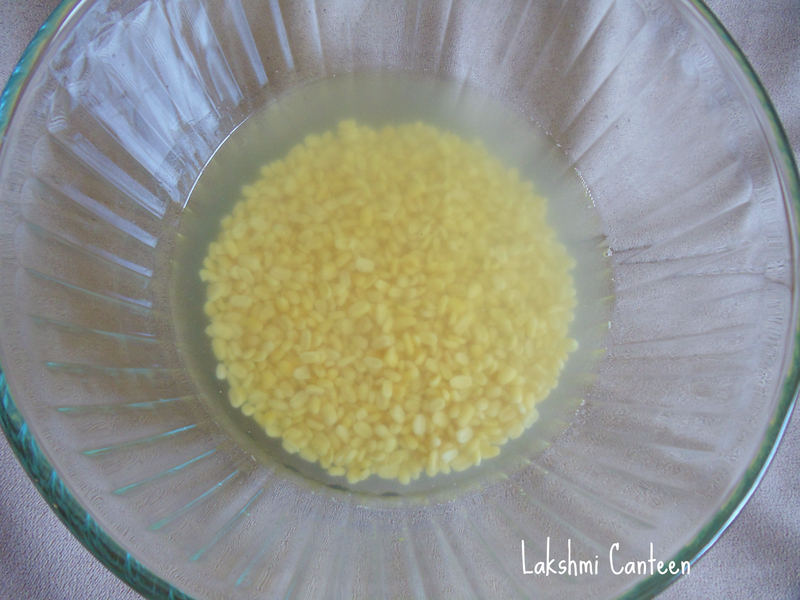 For seasoning- Heat oil and add mustard seeds. 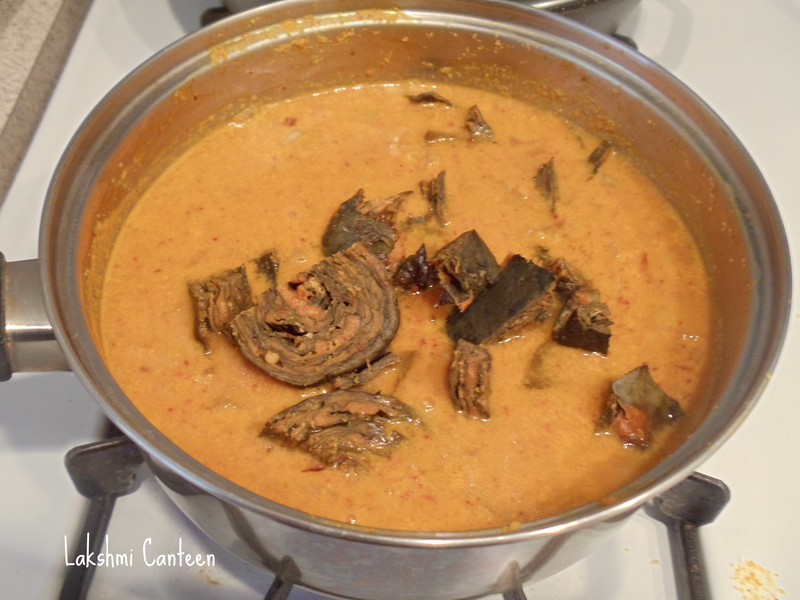 Once it starts spluttering add curry leaves and turn off the heat. 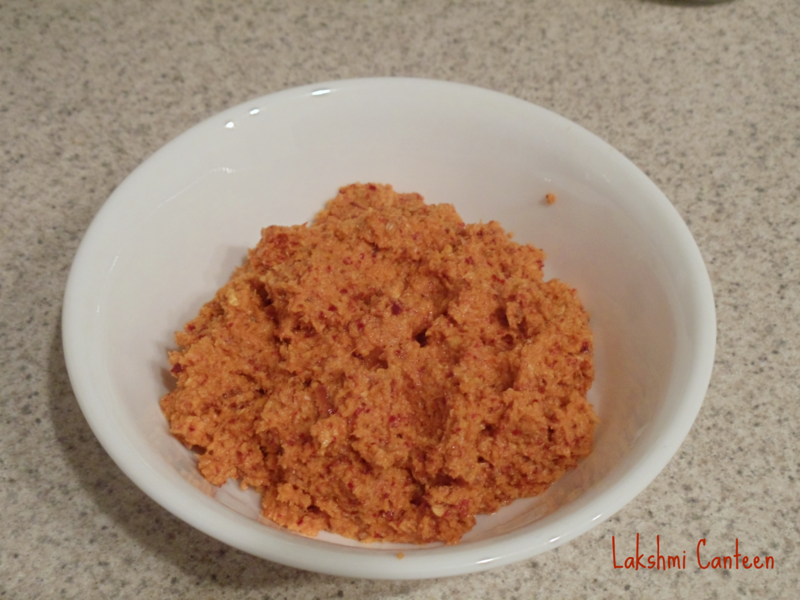 Add this to the carrot- moongdal mixture. Mix well. Serve it for lunch or dinner. Above measurement serves 2-3 people. *I used a medium sized potato instead of yellow cucumber. Wash the beans and soak them in enough water for 8- 10 hours. After soaking, they plump up. 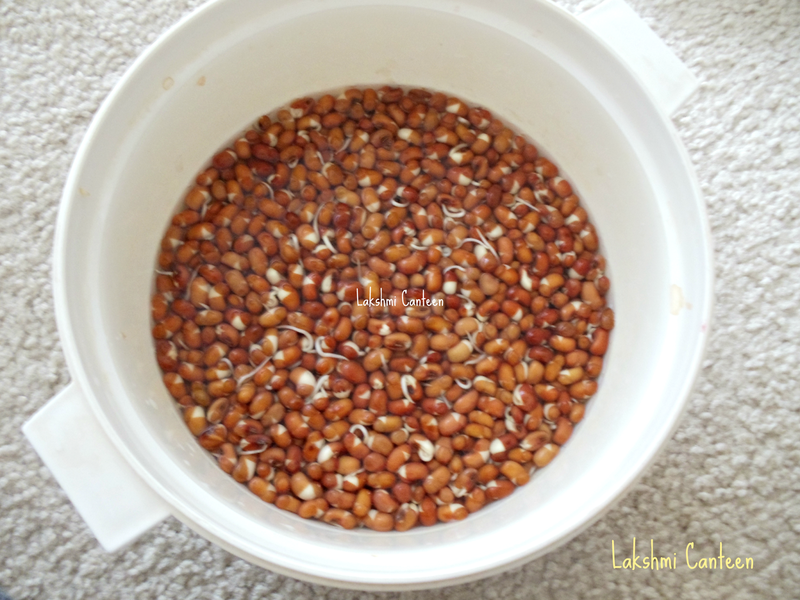 Now discard the water and rinse the soaked beans 1-2 times (drain the water completely). Then put them in a closed container or in a cloth and leave them in a warm, dark place for 7-8 hours. You can check out the detailed process of sprouting here. Now add the sprouts in a bowl containing water. 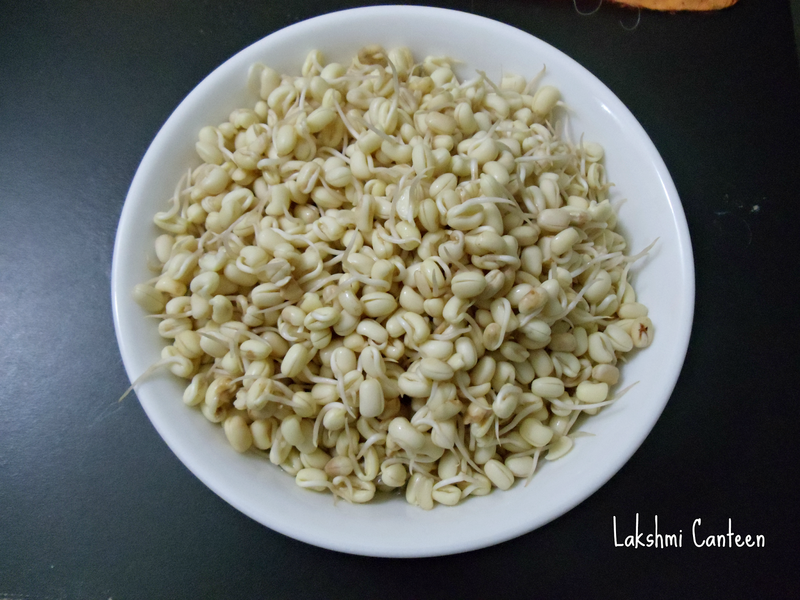 Then start peeling it one by one without causing any damage to the sprout. Then chop the onion and potato (or yellow cucumber). Now take the pieces of potato ( or yellow cucumber) in a cooking pot along with peeled sprouts, half of the chopped onion. Then add water (just enough to cook it) and salt. Start heating it. Close it with a lid. 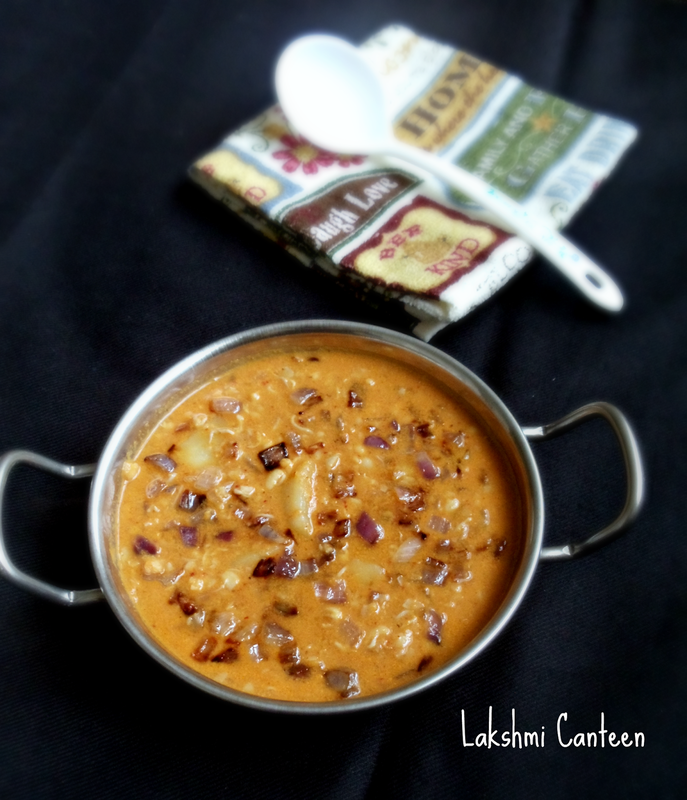 While the veggies are getting cooked, prepare the masala. After 20- 25 minutes, the cooked sprouts looks like this (don't over cook the sprouts). Now add the coconut based masala. Mix well. 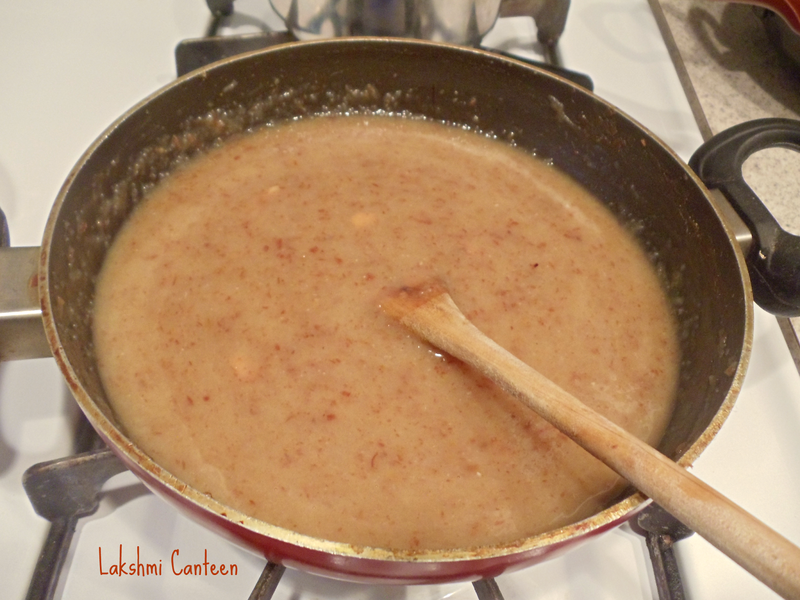 Adjust the consistency of the gravy by adding water (if required). I made it medium thick. Let the mixture come to a boil. Once it comes to a boil, continue heating for 2-3 more minutes and then turn off the heat and finally add the seasoning. 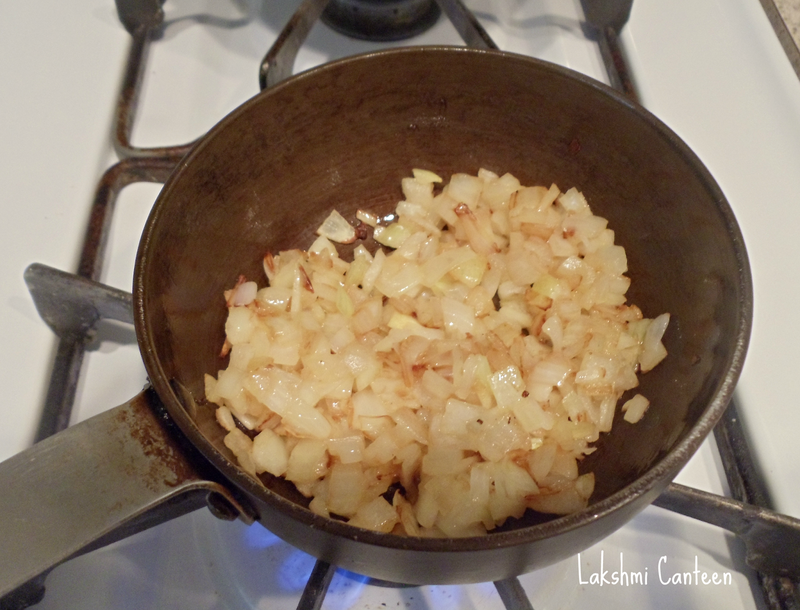 For seasoning - Heat oil and add the other half of the chopped onion. Fry it until it turns golden brown. 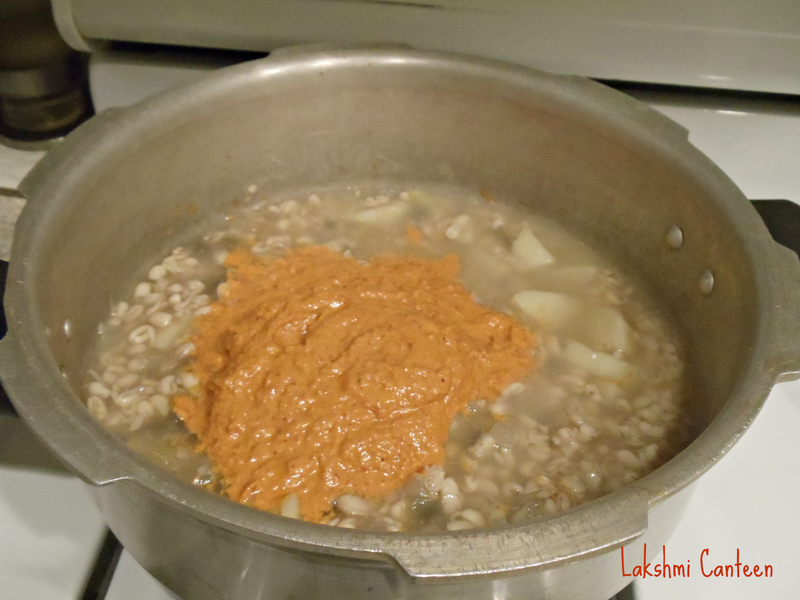 Add this to the cooked mixture and mix well. Kirlaile Bagade Ambat is ready!! 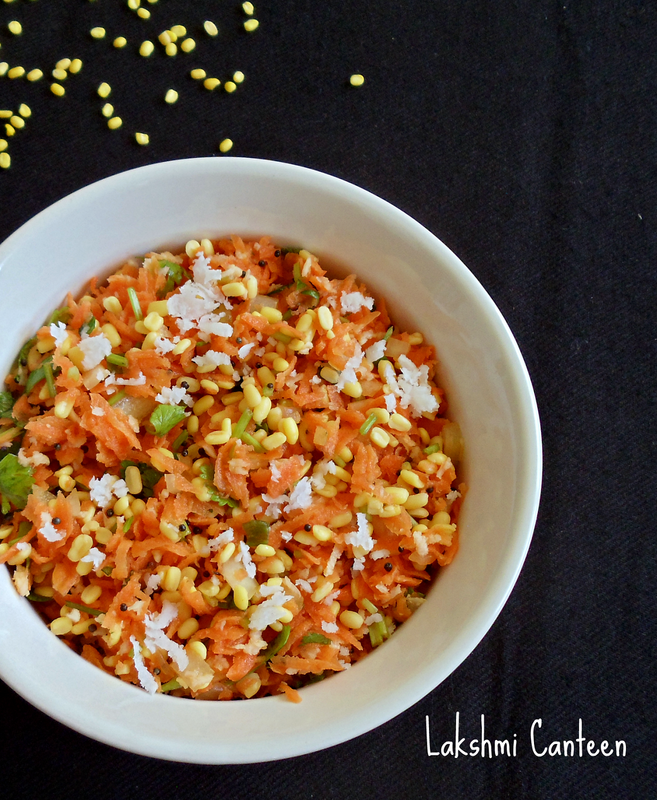 Serve it hot as a side dish to rice. Above measurement serves 3-4 people. 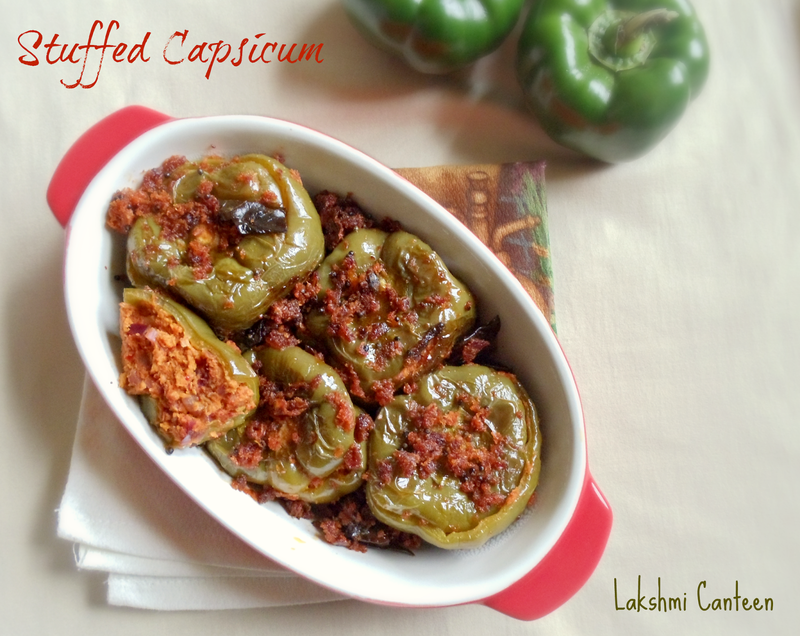 Stuffed Capsicum is a recent try in my kitchen. 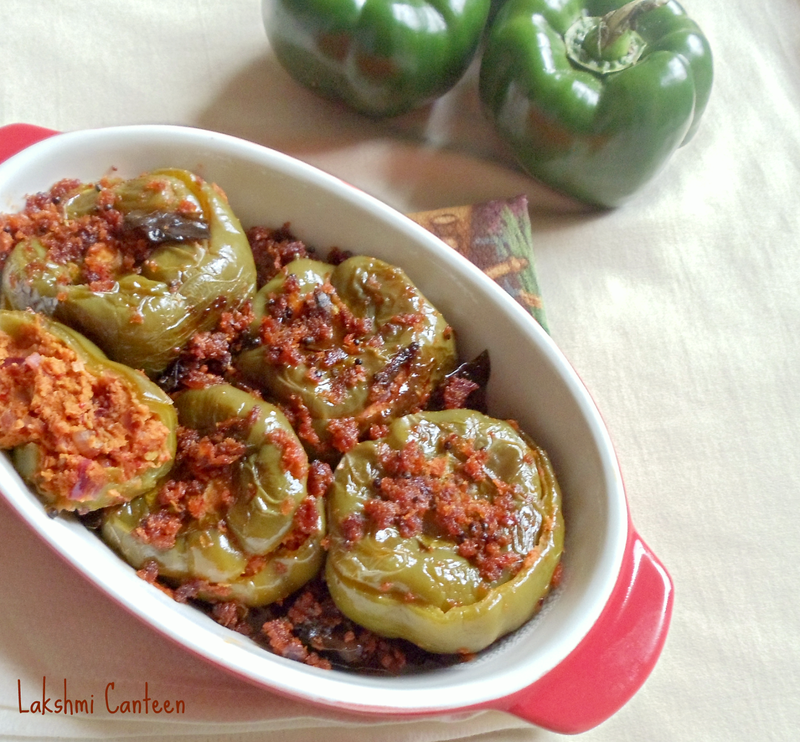 I noted this recipe (long time back) from a Konkani cook book written by Jaya V Shenoy. 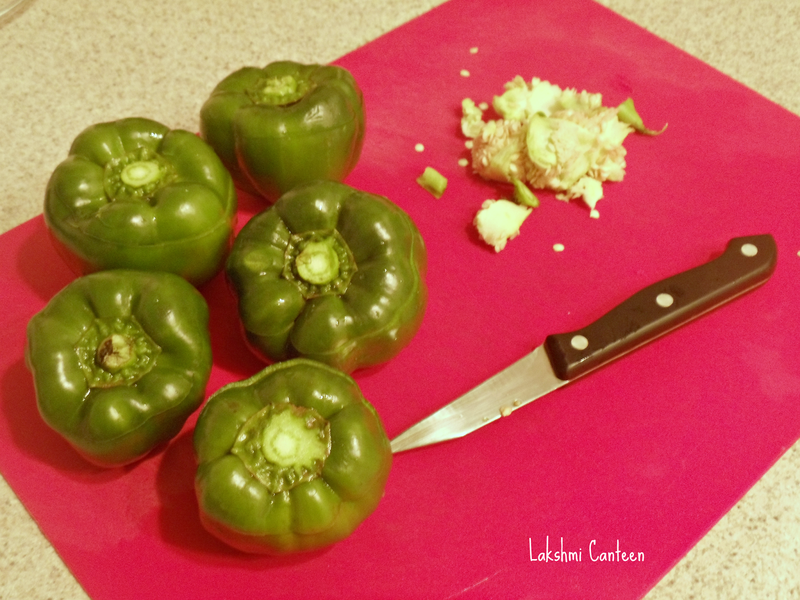 I did not want to try this recipe until I found small sized capsicum (green bell peppers). Finally I was able to find them in Farmer's market last week. 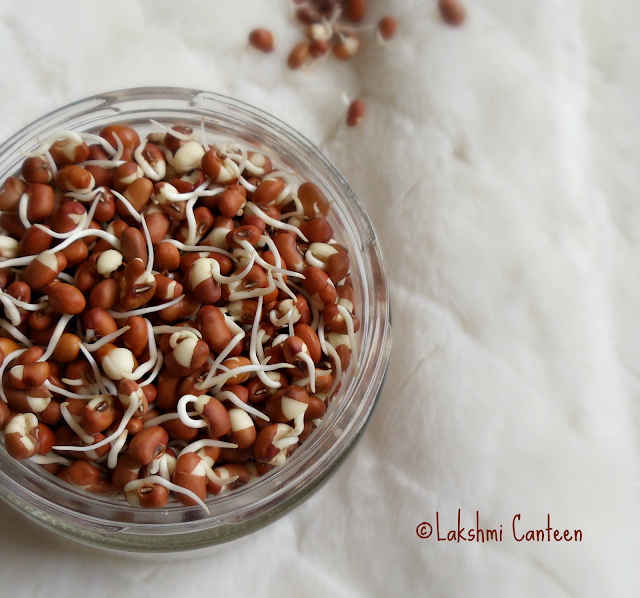 This recipe instantly popped in my mind and hence bought a bunch of these. 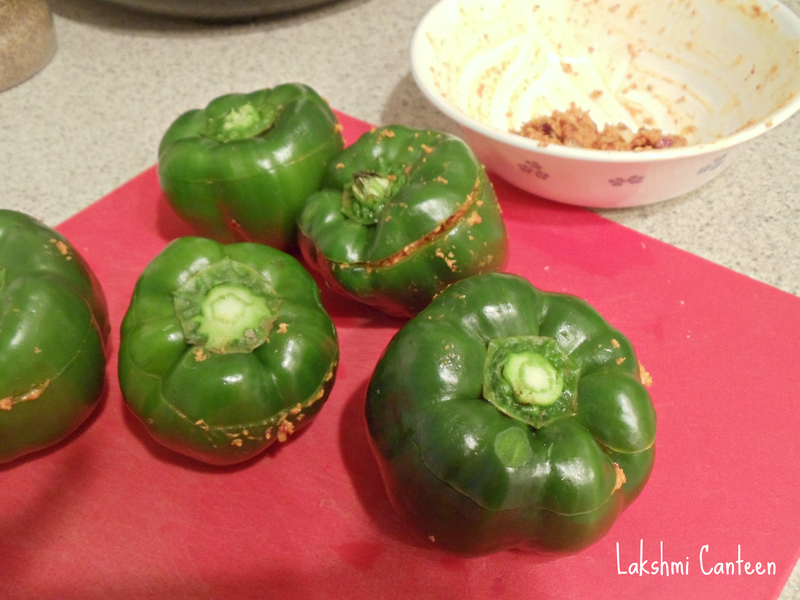 Once done, continue with the rest of the capsicum. 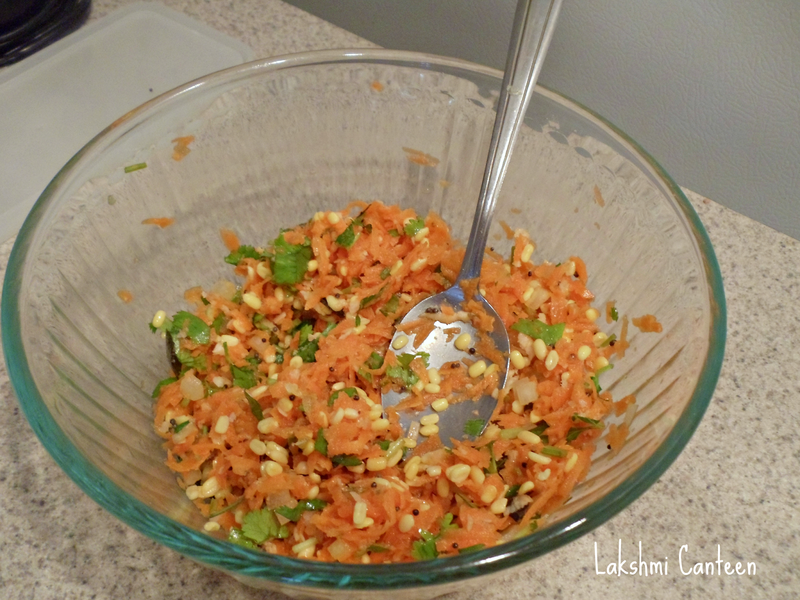 For the Stuffing - Fry coriander seeds and fenugreek seeds in 1/2 tsp of oil, until it turns light brown. Allow it to cool on a plate. 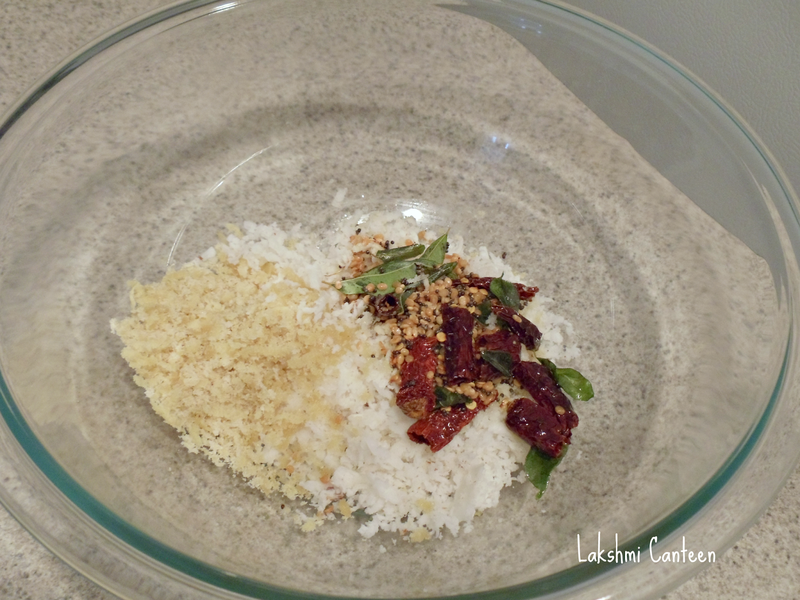 Now grind grated coconut, roasted red chillies, tamarind, jaggery, salt, roasted coriander seeds and fenugreek seeds, to get a semi coarse mixture. 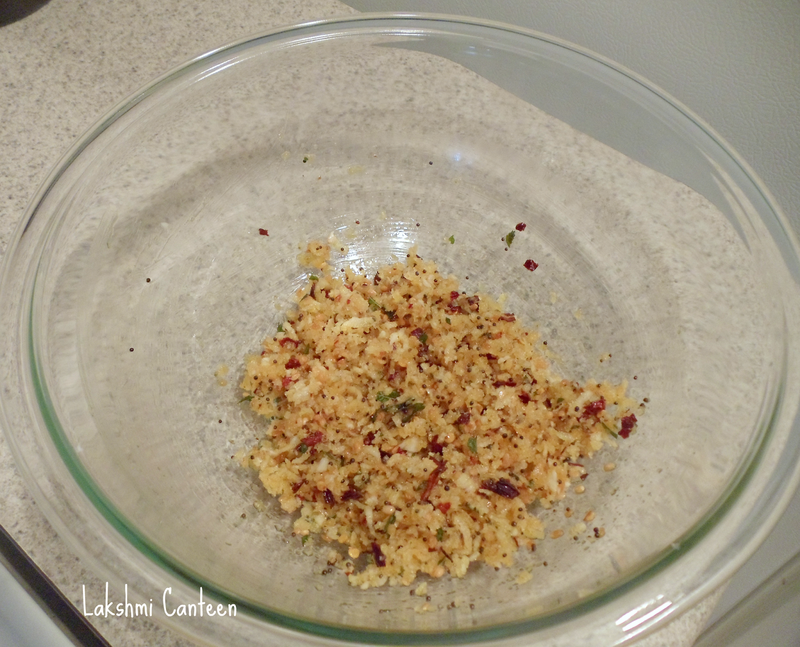 Add little water so that all the things come together (Don't grind the stuffing very fine). Transfer it into a bowl. 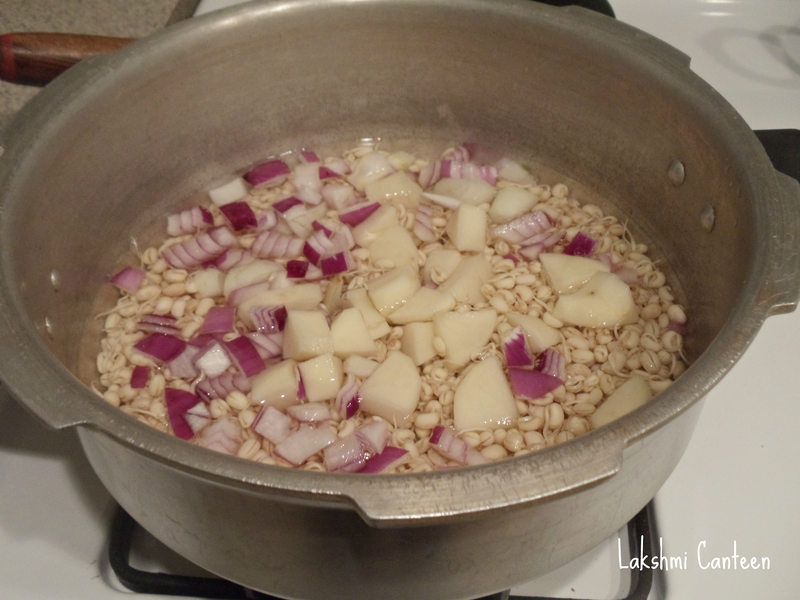 Now add the chopped onion to the ground mixture. Mix it well. 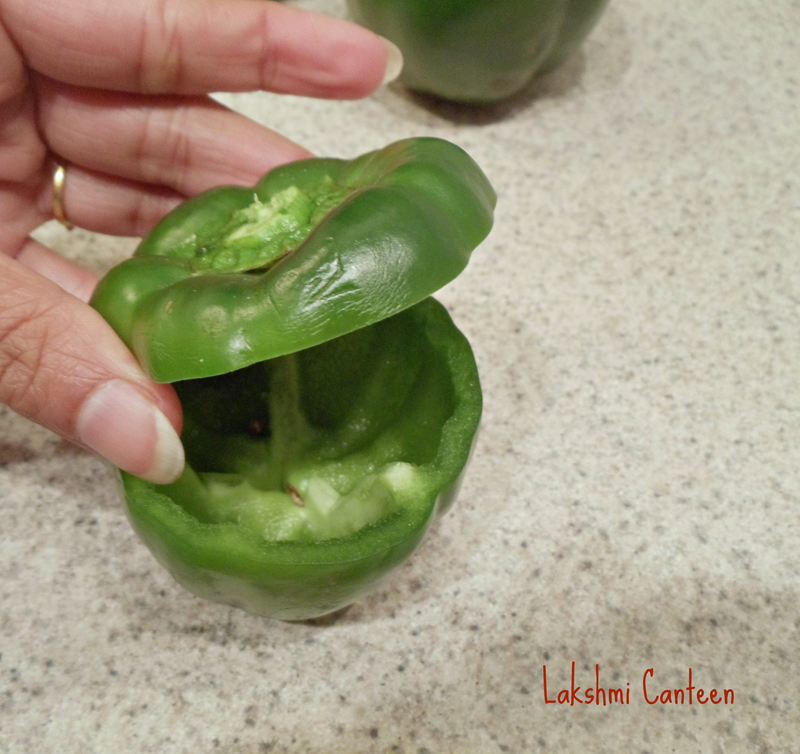 Now add a portion of this into one of the capsicum. Continue with the rest of them (I was left with little extra stuffing). Now take a wide pan and start heating oil. Once hot add mustard seeds. After they splutter add curry leaves. 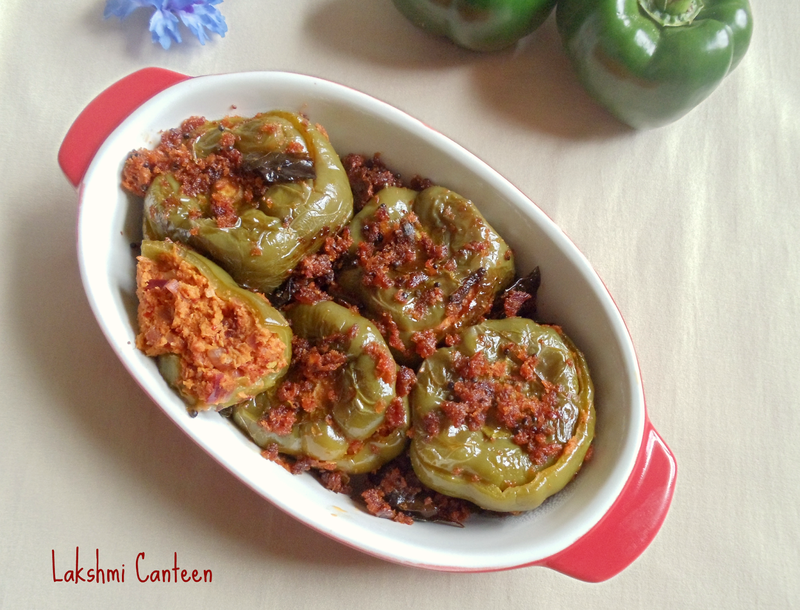 Then start keeping the stuffed capsicum one by one. Add the remaining stuffing in the oil and sprinkle little water just enough to cook. 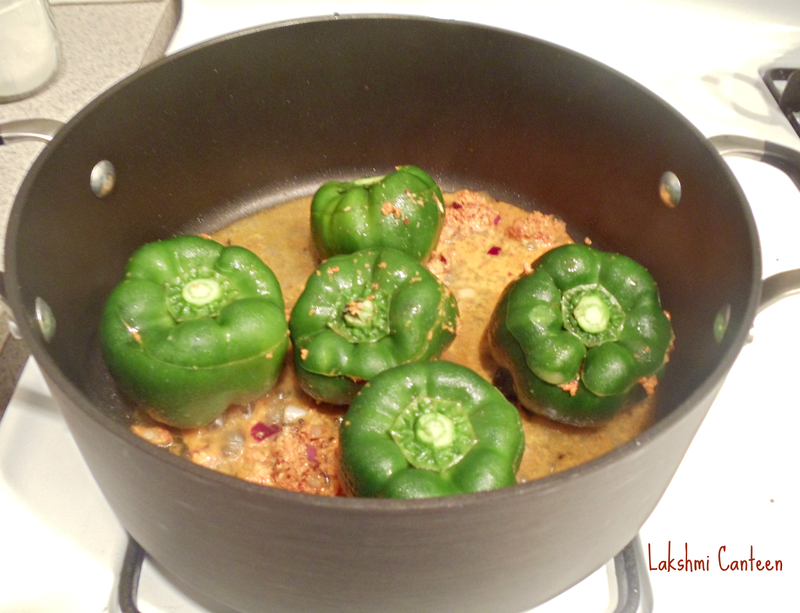 Close it with a lid and allow them to cook on a low - medium flame for 30 - 35 minutes. 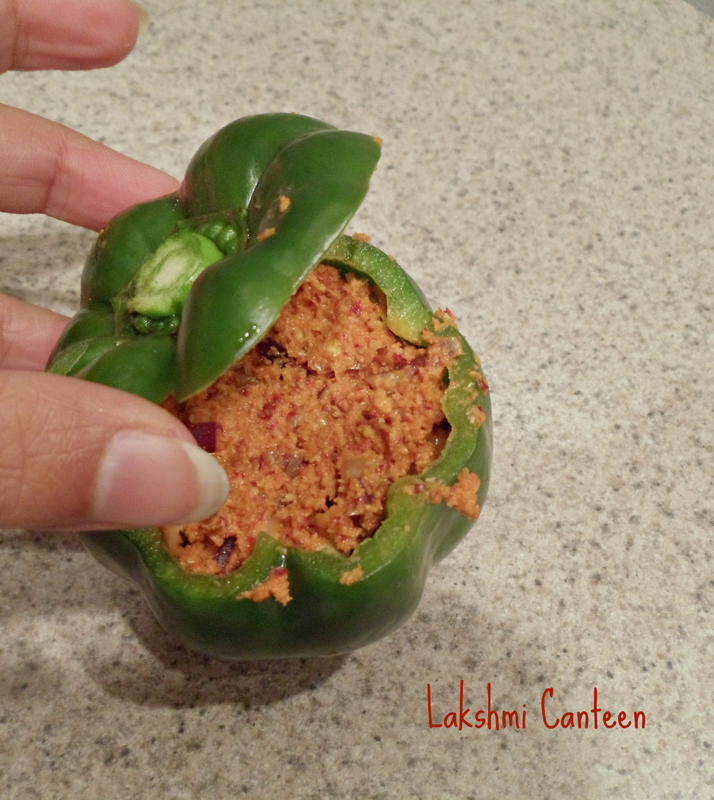 Keep turning the peppers (capsicum) every 8- 10 minutes so that they get cooked on all sides (Turn the capsicum carefully so that the filling doesn't come out). 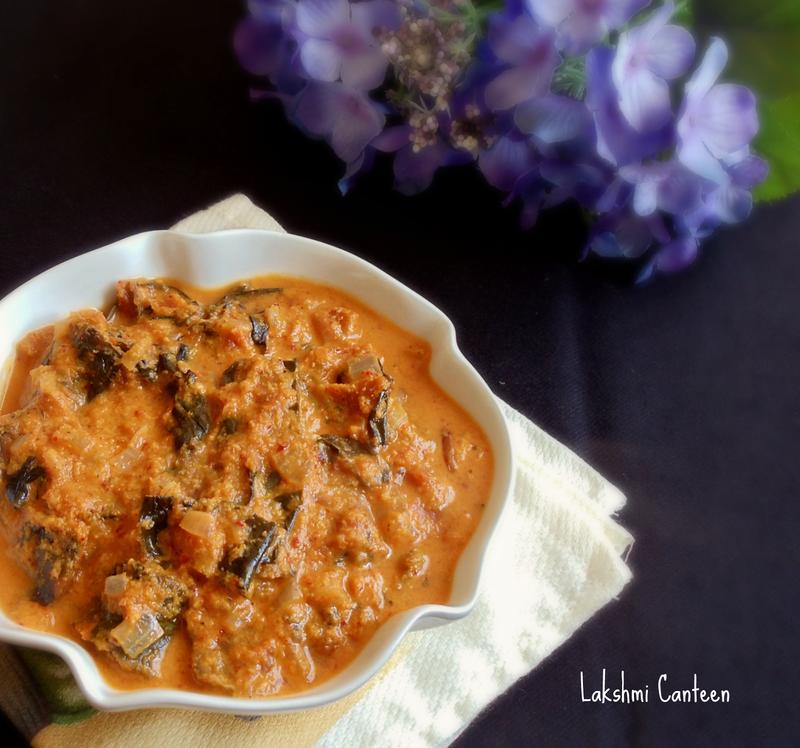 Serve it hot along with rice and dal or with rotis. Above measurement serves two people.